I tend to think about the concept of water governance quite often… in fact, I did a whole PhD on the topic. To me, it makes a lot of sense and, at least at the 10,000-foot level of analysis, can explain why some have access to water, others don’t, and why this matters to the challenge of increasing access to water, sanitation… or any other good or service, really. In general, I like to think of water governance as being the political and institutional framework that essentially defines access. At the most basic level, ask yourself, “how do I access water?” For most of us, we access it as a service in our houses and buy it as a product in discrete units (gallons)… and even, tangentially, embedded in the food that we buy. For residents of countries with non-existent, barely or non-functional infrastructure, access to water is a high stakes game. It is arguably a function of affordability and accountability—either they can purchase whatever they need and/or they can nudge their governments to provide it as a service. What governance looks like can vary greatly, and changes over time. One can find examples of water governance everywhere in history, from the dirgiste or top-down ‘hydraulic states’ that Wittfogel spoke of, where the ministers and presidents decide all (peasants be damned! ), to the intermixed central government, local government, and private interests and conflicts in the American west (Cadillac Desert has great stories about this), or even the local-level dysfunction that I documented during my graduate work. Does any of these mean anything beyond academic posturing? I’d like to think so. I often point to the 2004 World Bank World Development Report ‘Making Services Work for the Poor’ and the work of the Water Integrity Network. These sources provide numerous examples of how the water governance and the overall enabling environment can have a major effect on project effectiveness. IIED has one excellent example from way back in 2002 that shows how entrenched interests sunk a project. Actually, here’s an easier suggestion– just think about all the lack of accountability that has happened with the Flint water crisis…or watch the movie “Chinatown” if you want to think about water governance. Water governance is too big of a concept to cover in one blog post, and I’d appreciate your thoughts on any of this. 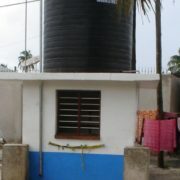 http://www.edbourqueconsulting.com/wp-content/uploads/2016/06/TANZANIA-Dwasco-Water-kiosk-Dar-es-Salaam.jpg 1079 619 admin http://www.edbourqueconsulting.com/wp-content/uploads/2016/02/cropped-cropped-63950_Ed_Bourque_Consulting_logo_01latest-300x141.png admin2016-05-21 20:35:282019-01-27 03:53:42What is ‘Water Governance’ …and Why Does it Matter?